Brea Mall - This upscale center hosts 5 major department stores - Nordstrom, Macy's, Robinsons-May, JCPenney and Sears - plus 175 specialty shops, the Foodworks Food Court and several fine restaurants. Fashion Island - featuring more than 200 stores, 40 restaurants and two cinema complexes in beautiful Newport Beach. Irvine Spectrum Center - The diverse offering of stores and restaurants is complimented by one of the country's largest theaters, Edwards Irvine Spectrum 21 Cinemas, and live entertainment venues such as The Improv Comedy Club and Crazy Horse Nightclub. Further adding to the fun atmosphere is an antique Carousel with horses and whimsical animals as well as a 108-foot Giant Wheel. The Giant Wheel opened October 3, is only the third such permanent wheel in California and the first in the state with a fully accessible gondola where the passenger can remain in their wheelchair. (The) Market Place - more than 100 stores to choose from and an exciting selection of dining and entertainment choices. (The) Outlets at Orange - Factory Retail Outlets and entertainment including Old Navy, Ann Taylor Factory Store,OFF 5th Saks Fifth Avenue Outlet, AMC 30 Theatres, Dave & Buster's and Lucky Strike Lanes and various themed restaurants. 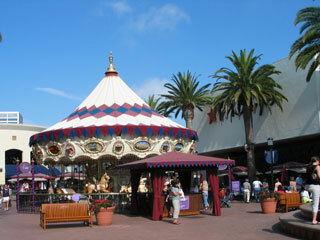 South Coast Plaza - Luxury shopping in Costa Mesa. Flagship stores are Macy's and Bloomingdales, plus dozens of upper-end boutique stores.